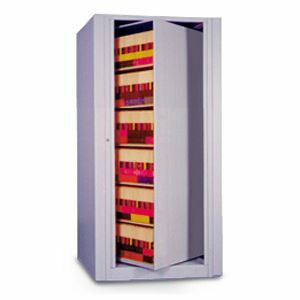 The EZ2® Rotary Cabinet Starter Unit from Datum consists of an inner cabinet with 6 shelves per each side that rotates within an outer cabinet. 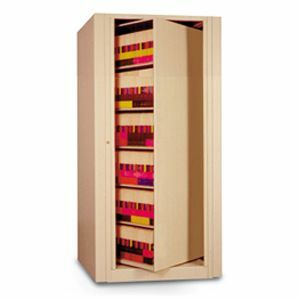 The EZ2® comes with slotted and adjustable shelves and two dividers per shelf opening. The base mechanism permits easy, manual rotation without the use of a pedal. Store everything from end tab folders to hanging files and computer media with a slight change of configuration. Units include 5 adjustable shelves and a fixed bottom shelf per each side. Backstops on all shelves, 2 dividers per shelf opening, levelers, a lock assembly that allows the unit to be locked in the open and closed positions, and an end panel kit.